M any components are essential to provide end users with their IT resources. Employees may work in satellite offices, from home or out “on the road”. They often have differing requirements and need different devices to perform their tasks. Orchard Computer Services can provide the parts needed to build that infrastructure and ensure the users have the secure access their role requires. Orchard have provided a comprehensive IT support solution for a number of Chilli Software’s clients. Their experienced team has always worked hard to keep my clients running smoothly with their IT infrastructure and I know that has been much appreciated by our clients. When servers have been upgraded and the like, and Chilli and Orchard have needed to work together to ensure a smooth transition for our mutual clients, Orchard have always been extremely diligent and dedicated. The necessity of most organisations is determined by the tasks they perform, this will often include the need for specialist software. i.e. for legal, accounting or design purposes. And whatever the business, most users need to use email and have access to the internet. Also create documents and spreadsheets etc. Orchard Computer Services can provide the components to build that infrastructure. Everything from Routers, Wireless Access Points and Switches to Keyboards and Mice. PCs, Laptops and Tablets to Servers and SANs. We can meet with your specialist software suppliers to ensure the systems we provide have the processing power and disk space etc. they require. And we can work with them to plan and implement a smooth installation process. In the past we have worked closely with software specialists that include accountancy, engineering design, doorstep deliveries of dairy products and food processing. we only use tried and tested products. O rchard Computers understands the importance of using quality products from reliable suppliers. When it comes to hardware and operating systems, there is always a cheaper option but it will invariably let you down. We trust Dell & HP for system hardware and Microsoft for Operating Systems & Office applications. 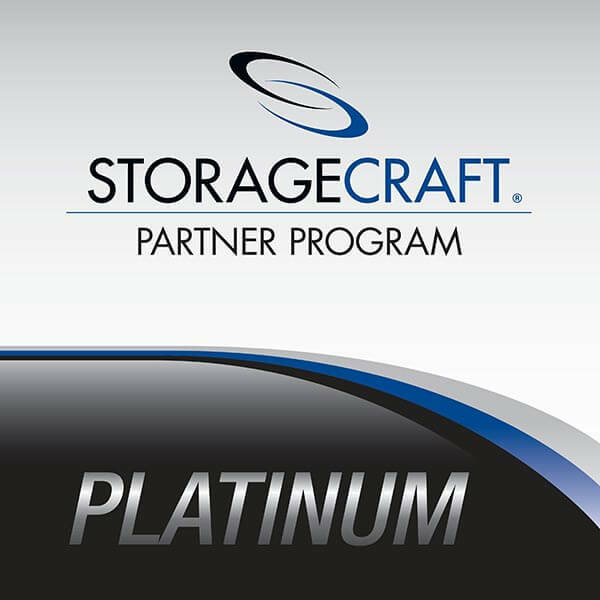 We are also a StorageCraft Platinum partner and their products are a fundamental part of our backup solutions. And if its Apple products you require, you can rest assured because we have Apple certified engineers.